There is a 10 car pile-up when it come to me and ideas for blog posts. Seriously. I have to pace myself on publishing, so when I paste bits and pieces together for a post, I'm a bit disappointed, because this is valuable real estate for my many bloggy brain storms. But some days call for a Cold Duck approach to posting, filled with odds and ends of time sensitive information. The term Cold Duck, many of you may recognize as a type of sparkling wine. Originally it stemmed from a German tradition of combining bottles of unfinished wine with champagne. Celebratory but frugal: that's my kind of living. And ladies, ladies, and one gentleman: today is Cold Duck Time. First in your glass, taste a sip of the upcoming SACRAMENTO FASHION WEEK, now slated for February 24th to the 27th. And yours truly will be sitting in the press box, eagerly covering the two fashion showcases. This year SACRAMENTO FASHION WEEK will be benefit a non profit organization. Make‐A‐Wish Foundation of Sacramento & Northeastern California will be the sole beneficiary. Tickets are on sale now, and for a limited time, you can get $25 off your ticket price if you order your tickets by January 30th. 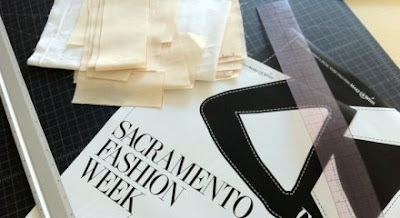 Any fellow bloggers who are attending Sacramento Fashion Week, and want to join me for some pre-event socializing, contact me so we can meet-up! You can get more information about SACRAMENTO FASHION WEEK on their website, http://sacramentofashionweek.com. Sparkling in my hand, like a tasty glass of bubbly is my shiny new iPhone. I am such a Luddite, that this is such a novelty for me. My cell phone was so old, people were remarking on how cute and quaint it was! I'd get comments like the following all the time: "I remember when I had a phone like that." And the feeling I got was that they thought I was sportin' it to be retro and ironic. Well, I just upgraded, and got the fancy-smancy phone of my dreams, and can't wait to start tweeting and snapping photos with it. Oh, yeah, and taking phone calls. So call me already! Over coffee, while checking in on Twitter, I discovered that Kristy Elena mentioned my blog, among others in her interview with WWD. Cut to the chase: "Eléna counts The Citizen Rosebud, Bryanboy (also one of the Full Time Fabulous judges), Grit and Glamour and Fashion Toast as her favorite blogs." Well, there you have it, friends. Blogger bits & bobs to mull over, courtesy of the Rosebud. I enjoyed and was pleased for you in every bit you threw at me. I wish I could be with you in Sacramento Fashion Week. You never know, perphaps one day I might just knock on your door for a cup of tea and apple pie. hehehhe. Sacramento Fashion Week sounds like it will be a blast - looking forward to your updates. And congrats on the WWD mention - was so excited for you and V when I saw that! Ha, my phone is terribly old too - I put my reasonably nice one through the washing machine so am having to make to with an ancient one until I am due an upgrade! I shall just pretend I am being vintage. Thanks, B! Looking forward in reading your tweets via my iPhone,ha ha. Oh these kinds of posts are the best!! Congrats on the mention, you deserved it :) I didn't know what "Cold Duck: meant until now too, so thanks for that! Bella--congrats on the mention. You deserve it for being the good citizen that you are. I am so luddite I refuse to carry a cell! Sara: you are such a sweetheart! Terri: you are uber-awesome. I commend you for going commando (san cellie) and know I couldn't do that myself. I love the access to a phone anytime. I'm one of the few people I know without the internet on my phone. I'm kind of glad I don't have it because I'm already on it too much. I-phone's are really fun though. That is so awesome you got a mention on WWD. You deserve it. Thank you, Heart. You know, you make such a good point about being on it too much. I'm needing to take a media diet soon, and reset/recharge my social batteries. I think I'll make it a policy to minimize my internet time spent on the phone. Thanks for reminding me about the need for media balance! Congrats on being mentioned by Elena in WWD as a favorite read. I read the article, very cool. IPhone, very nice. I have an android and I love it. Have an awesome weekend! You rock! congrats on the WWD mention.. funny I wondered if you had created a blog and had thought about emailing you. this is ideal name.. and for ideas on posts.. we should talk .. there are several ways you can spin this. Have fun at Sacramento Fashion Week!! Great news on well-deserved mention! Iphone, nice! I like the drag screen the best but am nowhere near getting one - one day maybe! Congrats on the shout-out dear! The new layout looks wonderful btw. And I wish I were home for Sac Fashion Week. Enjoy!! Aww... it must feel so good to be recognized like that. Congrats! And double congrats for your fancy new phone. Now that Verizon is finally getting it, I'll probably cave and get one too. My boyfriend has one and it's amazing. Enjoy! Yay! I know, the WWD mention blew me away too! Co congrats on that and your new iPhone! I have the same one. You might be the only other person I could video call with! Nice post:) and have a happy Sunday! Congrats on the WWD mention! So amazing, flattering and well deserved! I shut my iphone off but do miss it. It surprisingly takes decent pics, have fun! honey baby! you are so welcome for the mention. i was not sure who should would end up choosing from my loooong list of blogs that i started rattling off. she was like, "please slow down!" hahahaha. but i'm glad she chose your blog! 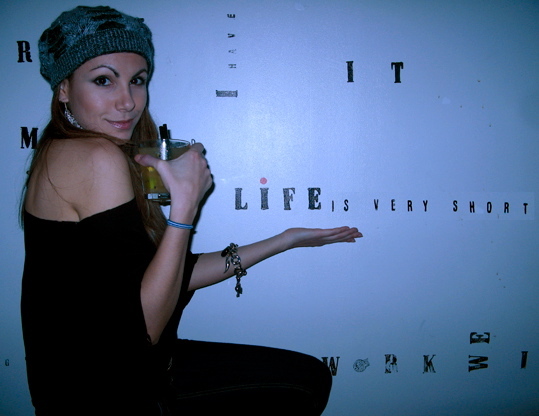 that is AWESOME about sacramento fashion week!!! i can't wait to see your coverage!!! You shouldn't be surprised about it..
Kristy will do so well.. Hopefully will get meet all of you one day.